We lease and operate the vehicles so you won't have a capital investment. In addition, we'll help generate real-time, measurable results as well as a lead follow up program to maximize your ROI long after your program is over. We offer every service you'll need for your mobile event marketing program, from design to execution and tear-down. We'll also customize your solution to meet your objectives and can use our additional services to boost its performance. Our flexible services will enable you to stay within your budget, including retro-fitting one of our existing vehicles. Our team of highly-experienced experiential marketing and logistics professionals will provide advice, ideas and recommendations on proven ways to get the most out of your program. We're located in the heart of the Midwest which can reduce your fuel charges and travel time compared to other locations around the country. 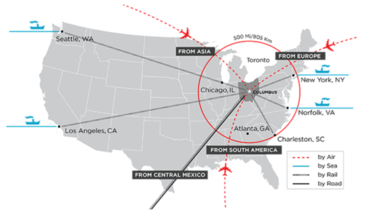 In fact, according to Three Scale Research, June 2013, Greater Columbus offers the greatest access to the U.S. market of any major domestic metropolitan area.